Want to have a look round the site of some of Canada’s TOP-SECRET communications throughout the Cold War? Well, you can, at The Diefenbunker, one of the country’s most unusual and fascinating visitor attractions, just 20 miles outside Ottawa. Last year I stayed in the capital to celebrate Canada’s 150th Birthday. During my trip I hired a car to explore some of the nearby sights. 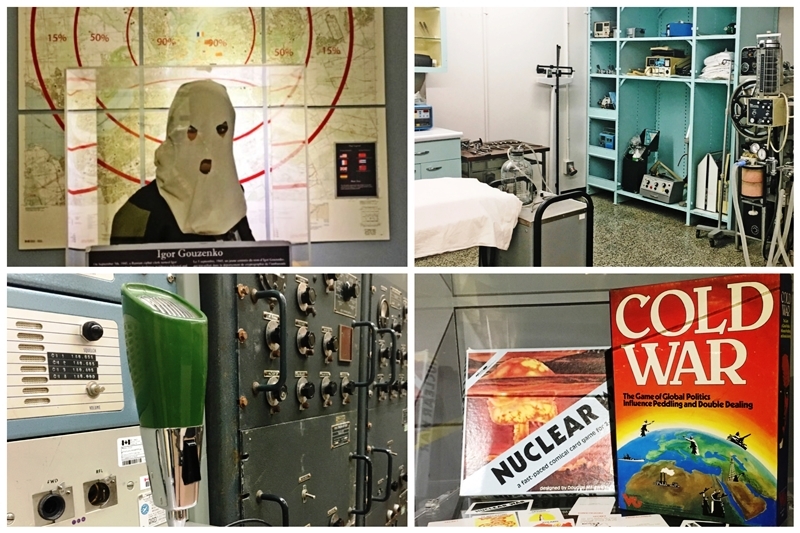 The Diefenbunker was without doubt the strangest and most compelling place I visited. The site was completed and began operation in 1961, and remained in continuous operation until it was decommissioned in 1994. As you’d expect, the exterior of Canada’s Cold War HQ is insignificant but as soon as you enter you know you are in somewhere VERY different. Walking down the Blast Tunnel is quite unnerving, especially when you are told that the massive doors to the actual bunker are perpendicular to the tunnel to reduce the effects of a nuclear shock wave. It was built to withstand a nuclear blast of up to 5 megatons from 1.1 miles away. 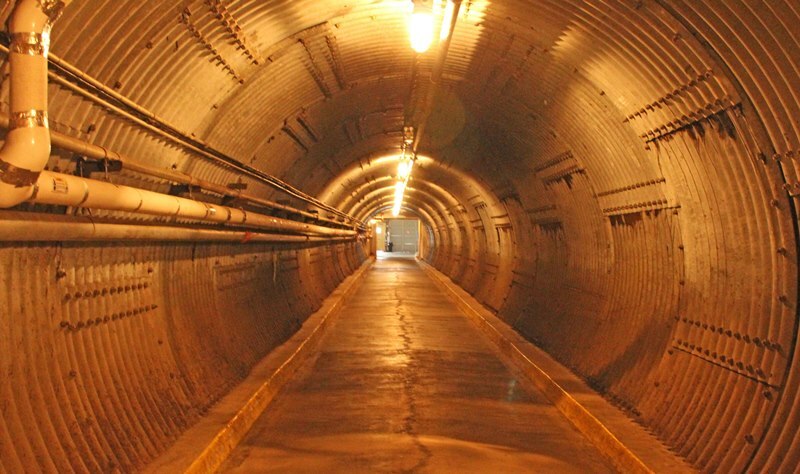 The Diefenbunker is the only one of its kind, virtually unchanged since it was decommissioned. I’d highly recommend booking a Guided Tour as you will learn a huge amount about this unique visitor attraction. The 4-storey bunker cost C$20m+ to build. 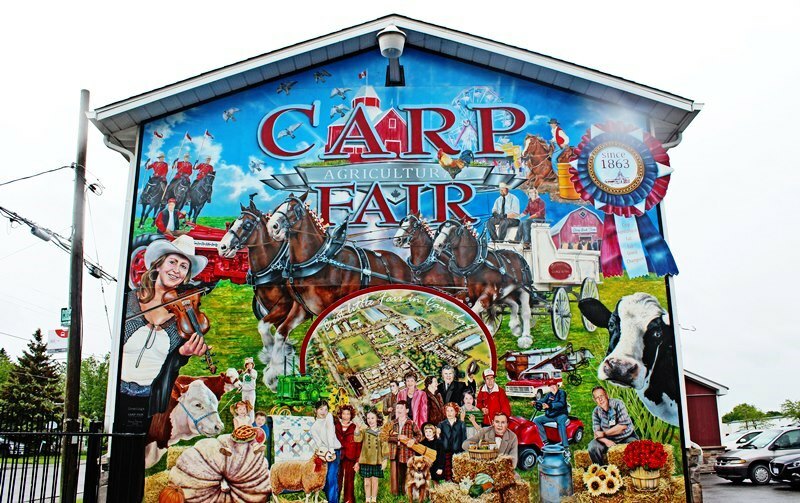 During its 32 years of operations it was also Canadian Forces Station (CFS) Carp, with a staff of 100-150 people and a 24-hour shift rotation. It held enough food rations, fuel, fresh water for up to 535 people for 30 days and the building was prepared to go into lockdown at any moment. There was also everything needed to keep the Canadian Government operating during this time. Facilities included male and female sleeping quarters, kitchens, eating areas, recreational space, a 200-bed hospital, dental surgery and and one of the earliest computer systems. 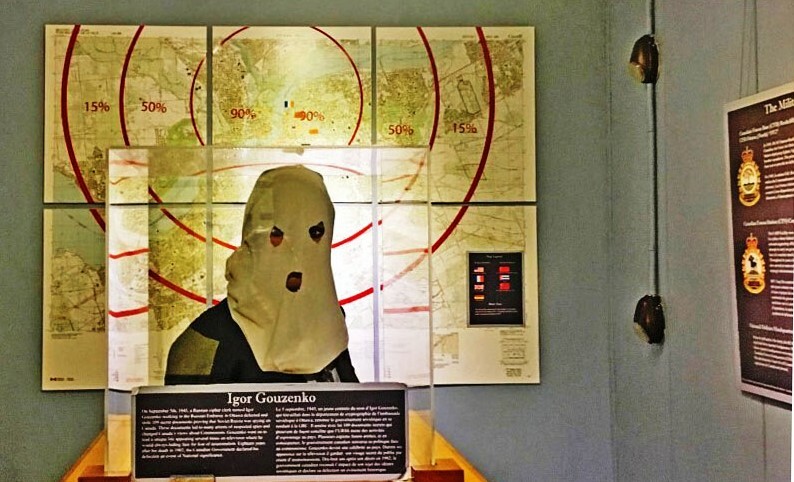 There’s a section dedicated to Igor Gouzenko, who defected from the Soviet Embassy in Ottawa on September 5, 1945, with 109 documents on Soviet espionage activities in the West. This was just three days after the end of World War II. He exposed Joseph Stalin’s efforts to steal nuclear secrets and the technique of planting sleeper agents. The “Gouzenko Affair” is often credited as a triggering event of the Cold War. In the Canadian Broadcasting Corporation studio you can hear a spine-chilling recording of the announcement that would have been sent out, had a nuclear attack been launched. You can also see nuclear rockets and examples of Cold War board games. Going down to the lowest level, there’s a huge vault that was made to hold the Bank of Canada gold reserves. More poignant are the 11 Steps to Survival, including ‘Have 14 days of emergency supplies’ and the awesomely useless ‘Know how to get rid of radioactive dust and sand’. In those days, knowledge of the long-term effects of radioactivity was scant. Much of the place has been left just as it was when The Diefenbunker closed. There are rooms with higgledy-piggledy piles of boxes, supplies and items for everyday living. You can easily imagine people bustling about carrying out their important mission to keep Canada safe. 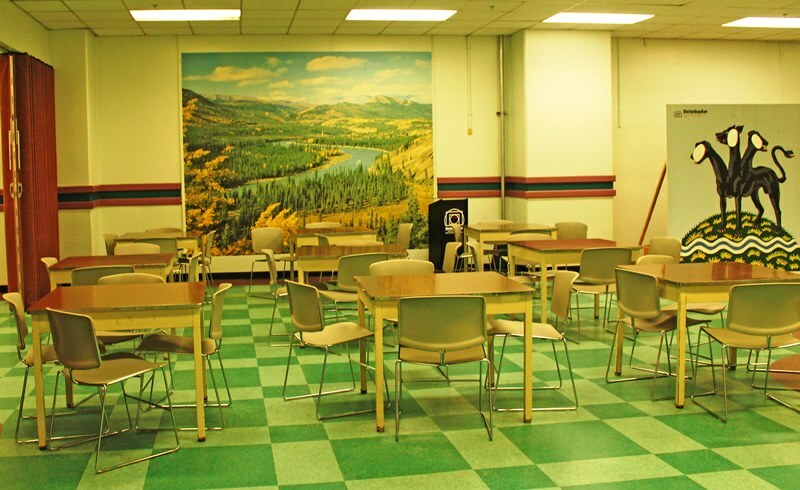 The large dining/recreation area has a huge mural of the Canadian Rockies, put up in lieu of a window to remind inmates of the glorious countryside they were working to preserve. 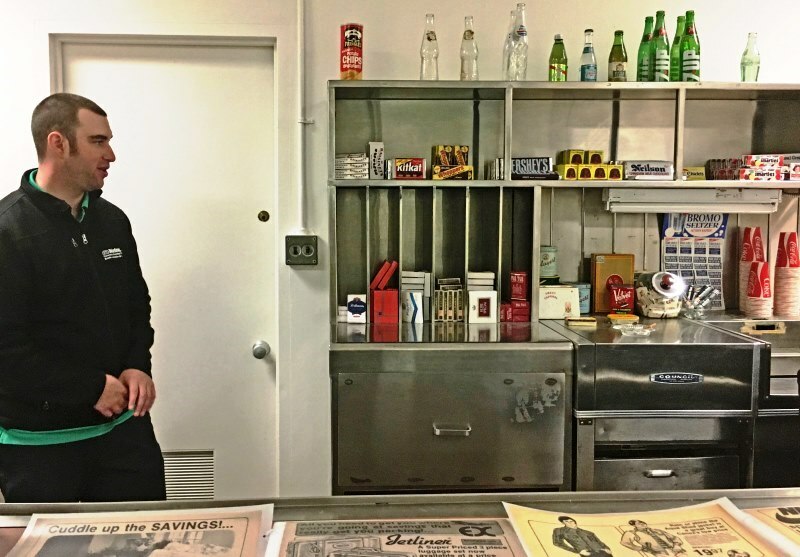 To help keep up morale, there was a shop selling things the staff might miss; magazines, cigarettes, favourite snacks, chocolate, including Hershey bars, sweets, toiletries and soft drinks (no alcohol allowed). One of the magazines from the 1950s had an advert for the latest kitchen gadget, a microve, for the Special Offer price of $899.97 – a fortune in those days. The Prime Minister’s Suite was slightly more luxurious than the simple sleeping quarters. 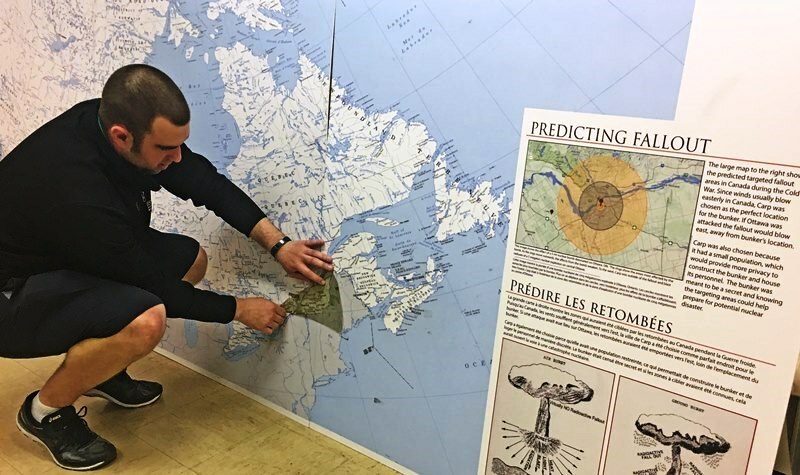 I was shown the Operations Room with a huge map of Canada showing the area that fallout would reach from Ottawa, depending on wind direction. It’s these things that bring home just what a real threat the Cold War posed and also the futility of it all. From construction to the end of the Cold War, between 100 and 150 people worked 24 hour shifts to allow secret communications for the Department of National Defence. Ironically, Prime Minister John Diefenbaker never visited the place he instigated. 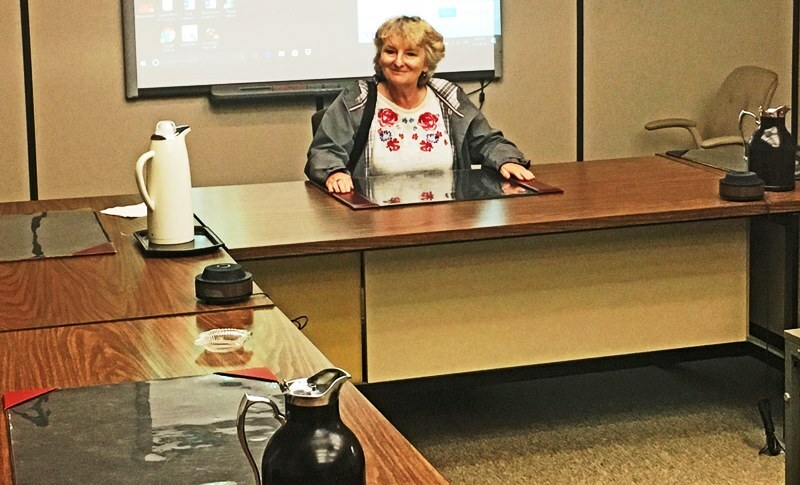 I sat at the Operations Table where the Government would have met should the worst have happened. 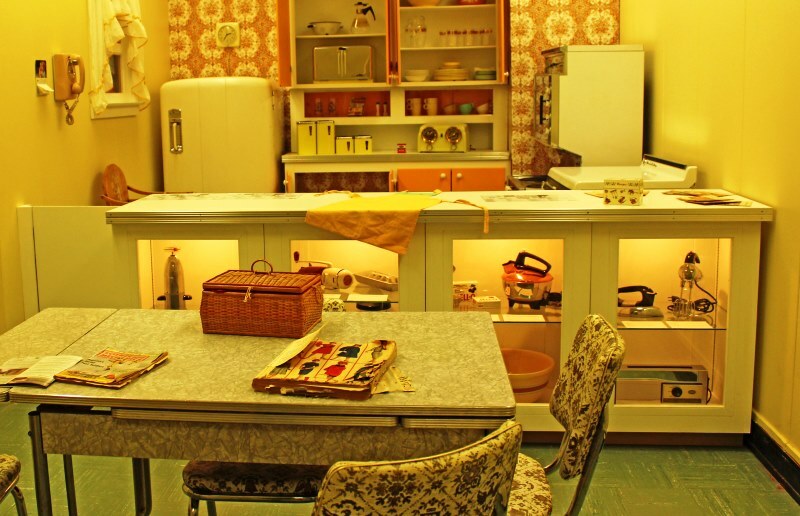 With its original notepads and bakelite coffee jugs, it brought home just how real that nuclear threat was to the people of Canada and what lengths they went to, to preserve their homeland. Fortunately none of the bunkers around Canada was needed for evacuation, which is a good job as nuclear fallout lasts much longer than the 30 days they’d planned for. 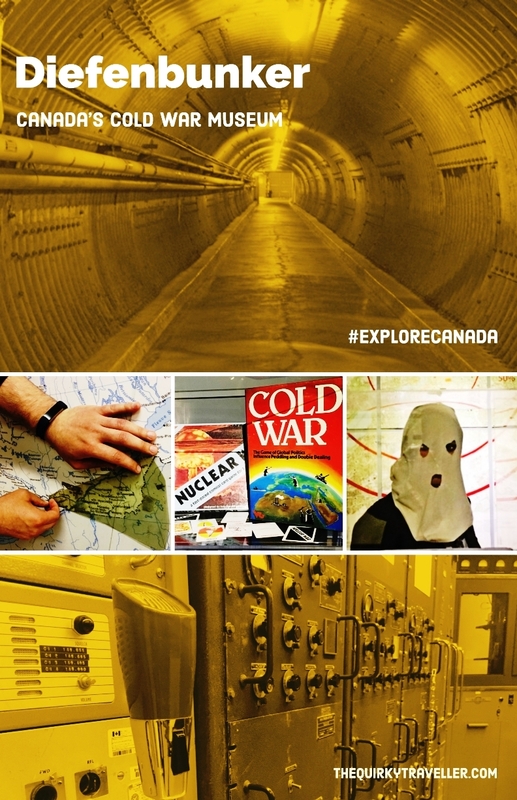 The Diefenbunker was given National Historic Site status in 1994 and CFS Carp was closed the same year. It opened as a museum in 1997. For more information click here Diefenbunker Museum. 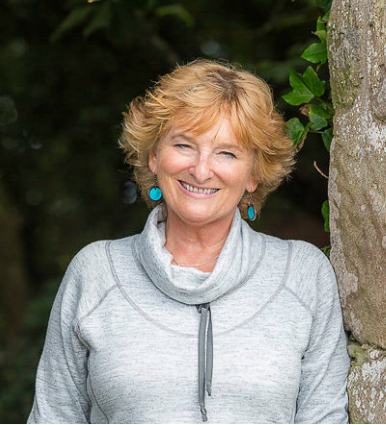 It’s open all year round so ideal for an excursion whatever the weather and would be of interest to all ages. I thoroughly enjoyed my visit and would highly recommend it for anyone wanting to get an insight into a challenging time in history, not just for Canada but the whole world. If, like me, you have worked up an appetite prowling the corridors of The Diefenbunker, call in to Alice’s Village Cafe for a bite to eat. 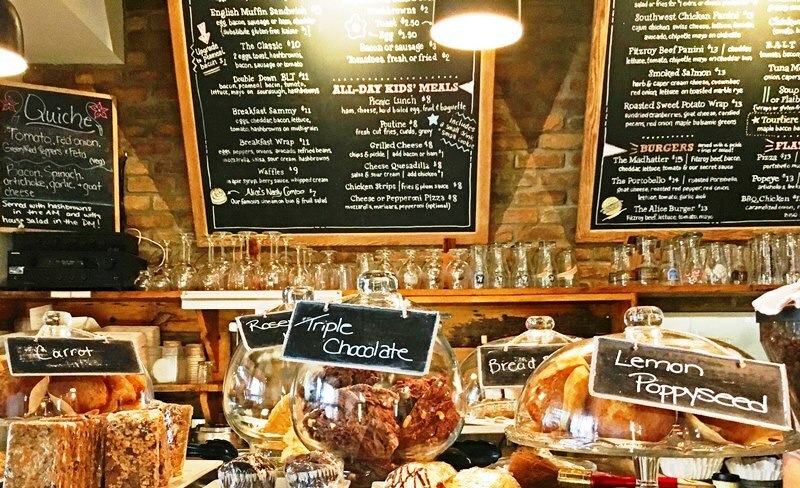 This quirky little cafe serves the most delicious savoury dishes, cakes, bakes and other tasty confections. Great place to meet the locals who are both friendly and informative. I met a lovely retired couple who remembered when the bunker was built and knew people who worked there. Sponsored Post: This article is written in collaboration with Destination Canada, sponsor of my visit to Canada. Click the link to see their comprehensive website with loads of info about visiting Canada. It was a pleasure to explore more of this country of unforgettable experiences, friendly people and breathtaking sights. I’ve visited some very unusual museums around the world, but this one has to go to number one. It’s really does merit the word ‘unique’ as there is nowhere else like it. I have vague memories of the ‘Cold War’ from newspapers and TV reports as a child and It’s genuinely moving to see this historic memorial to that time. This place is on my list of to visit locations in Ottawa! Sounds fascinating. I’m sure you’d find it really interesting Stuart. Hire a car to get out there and you can also visit Fulton’s Pancake House (check opening hours) and for more heritage, go to ‘Upper Canada Park’. All unique Ontario experiences. I’ve not been to that museum. As my dad was a cold war RAF Pilot we probably should take him one day. maybe next year if we get the chance. That sounds like the perfect place to take your dad, Nim. There are so many artefacts from that time and with his background it would not doubt bring back many memories. He must have some fascinating stories to tell! Thank goodness it was never needed. It chills me to the bone just thinking about it. It really does sound a fascinating place to explore but must have you the shivers! Do hope you get there Karen; with your family history it would have extra significance. It’s very handy for a trip from Ottawa if you’re staying in the capital. I travelled from Toronto to St. John’s last year. Ottawa was the only big city where I missed 🙁 . Well, I hope I will visit it next time . Thank you very much for this interesting post.